Way back in the ancient days of Napster, a wonderful thing happened: all these obscure and terrific tracks you never thought you would hear again suddenly appeared. I never downloaded music that I could buy, but I did love the fact that I could find stuff that was rare or would never be re-released for any of a number of financial or legal reasons. I found a Bram Tchaikovsky track I hadn't heard since I was 17 that way! Seems like YouTube is providing a similar service...Kosh sent this one 'round last week and I have to agree with his assessment: LORDY LORDY! To hell with the Three Tenors...how about these three?!?! 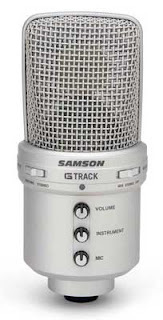 A couple of weeks ago I happened on this piece on the new Samson USB mic in the NY TIMES...a must-read every Thursday, if you ask me. It looked like just the thing for scratch narration. Turns out it's designed for aspiring podcasters and singer-songwriter types. I plugged it in and away I went. The voice quality is really good, but the ease-of-use factor is the BEST. Laying down some VO is a piece of cake. I still haven't bothered to learn the software that came with it...I just recorded in to Audacity, cleaned up and exported the audio, and then cut the final piece in Vegas Movie Studio (which is what I use to cut video). As a test I created a piece to send to Weekend America, a radio show I like to listen to on Saturdays when I am kicking around. They have this great segment called "Weekend Soundtrack" where people talk about what they listen to on the weekends. It always made me think about the Jam song, "Here Comes the Weekend," and that got me thinking about what I love listening to on the weekend.